The photograph from the Fairport interpretive panel illustrates our observation and helps connect the Lois McClure to the town’s history. Here we see an Erie Canal boat, so designated because it has a cabin at both ends, a rear cabin for the family that operates the boat, and a forward cabin for the horses or mules that tow the boat on the canal. A careful look at the photograph also reveals a “Derrick,” invented by Mr. J. Y. Parce of Fairport, patented (#24912) in 1859, and eventually built for the DeLand Company. We have not yet determined whether this heavily laden canal boat is loading or unloading. 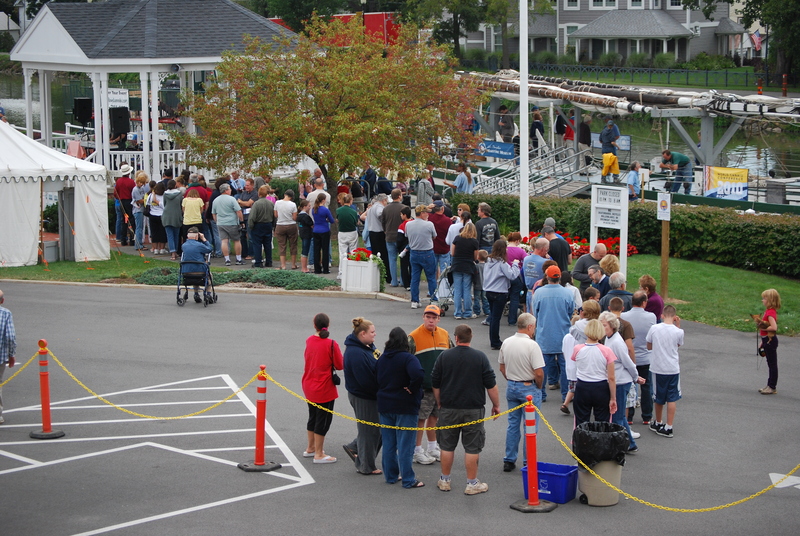 We then traveled west to Spencerport, where we’ve had an incredible reception from over 1000 enthusiastic visitors. We arrived on Monday afternoon and were greeted by a large and enthusiastic crowd, who formed lines waiting to get on board. I have finally experienced what it feels like to be a “rock star for history.” We saw many kids, who despite being just a day away from starting school, had an interest in history that was truly gratifying. In the park and gazebo next to the boat, music and dancers, artists, and food vendors made it feel like a festival. Mayor Joyce Lobene made us feel very welcome indeed. One of the visitors in Spencerport on Tuesday was Town Historian, Carol Coburn, and I enquired if she had any images of canal boats here during the towpath era. Before the day was out, Carol had made copies of a number of wonderful photographs, including the photo below. It is another great example of canal boats like the Lois McClure in a community we are visiting today. It appears to be a posed photograph, with canal families and crews on deck for the camera. The boats appear to be without cargo and it looks like the canal is closed for some reason, perhaps a break in the towpath ahead. Carol is doing some research to help us better understand the story.